ISE professors William “Al” Wallace, Martha Grabowski, and Thomas Sharkey, along with DHS Fellow and graduate student Richard Garrett, use computer simulation models to show how coast guard can respond effectively to future oil spills. The team looked at previous theoretical work and coupled it with new data—much of it sourced from site visits and interviews—to develop their DMARA Oil Spill Response (OSR) model. With 272 resource types, 11 task categories, and more than 17 locations, the case study resulted in around 10 million variables for just nine possible incidents. 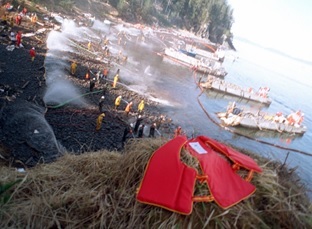 The project is funded by the Department of Homeland Security Center of Excellence Command, Control, and Interoperability Center for Advanced Data Analysis (CCICADA) at Rutgers University with support from US Coast Guard District 17, the Coast Guard Research and Development Center, and oil spill response organization Alaska Clean Seas. For more information, please click here .